Dogs and humans…we go way back. Before we raised cows, trained birds, and even before we had ever seen a buffalo, we had canine companions. Both the new world and the old world are home to dog remains dating back at least 12,000 years, buried in the company of their human masters. But when did we start decorating our dogs, restraining them, and identifying them with collars? We’ll take a look at dog collars from the ancient to the post-modern, and see how history and our changing attitude toward animals has influenced the way we collar our pooches. Everyone has heard about how much the Egyptians loved their cats, but they owned dogs as well. In fact, even though dogs were not as revered in the home, they served more often than cats as gods and as symbols. Dogs were never depicted as “pets,” but always as hunters or protectors. However, just as cats and precious possessions would be mummified with their owners, so too would the canine hunting companions. By the peak of ancient Egyptian civilization, collaring and leashing was standard in dog training, and collars by themselves had been in used since the pre-dynastic era. 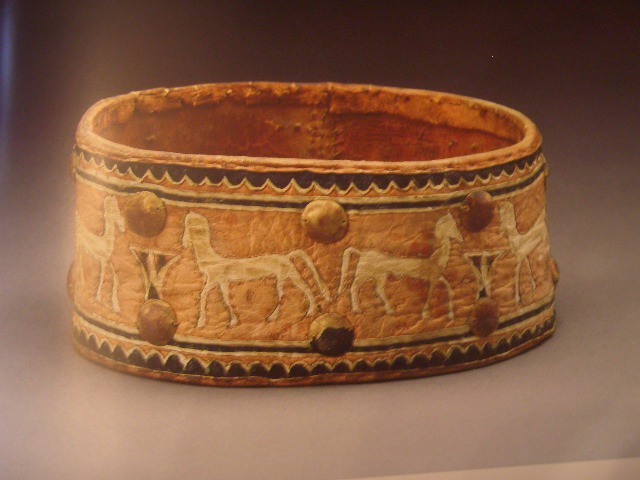 The dog collars of the day were oftentimes works of art in themselves. Farm dogs in ancient Greece wore similar collars to the spike-studded ones their medieval successors would wear. A sheepdog, which had to be white in order to be visible at night, was given a leather collar studded with nails, called a melium. This protected his furry neck from the bite of a wolf as he defended his flock. Greek farmers, like many modern dog owners, preferred their dogs to be fierce, but not overly aggressive. They had to be tough enough to attack intruders but friendly enough not to turn on their handlers. It is interesting to note that while the sheepdogs had to be white, the farmhouse dogs had to be black — so they could conceal themselves better to surprise intruders. 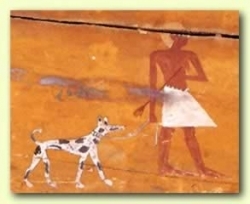 Ancient Greeks continued to fawn over their dogs like the Egyptians before them and like most civilizations after them. In towns, small friendly dogs called Alopekis were the constant companion of women and children, and even used to “herd” small flocks of geese or whatever the family raised in town. Supposedly the women would carry the tiny pups in the sleeves of their garments as they went marketing. Women were denied an active civic or social life, so the dogs may have been a very important source of companionship. The descendants of these dogs still roam the streets of Greek cities today. While mythological dogs did not often sport collars, their stories give us insight into how people perceived and treated their dogs in antiquity. Myths such as Artemis and her hunting dogs explained phenomenons like rabies. It was thought that she would sic her dogs on greedy hunters to inflict them with paralysis and madness; blaming lethal diseases on gods and their dogs is always healthy. The Greek myths also showed much respect and appreciation for the loyalty of their dogs. 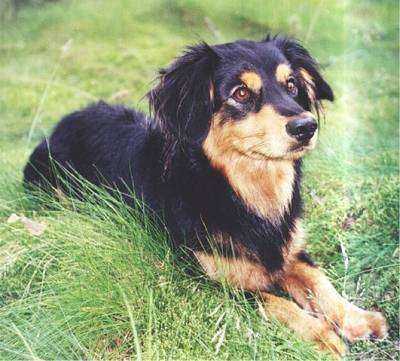 Odysseus’ dog Argos waited twenty years for him to return, even though the old dog had long since been cast out of the house for being flea-bitten, decrepit, and covered in ticks. Since no one else recognized the aged Odysseus, Argos identified him with a wag of the tail, and then dropped dead after waiting twenty years to perform one final duty to his master. Even the Greek-derived term “cynic” comes from “dog.” It had both positive and negative connotations for the Cynic philosophers — they lived in the streets and were uncouth like dogs, but they were loyal to their friends and could easily identify and deal with an enemy. 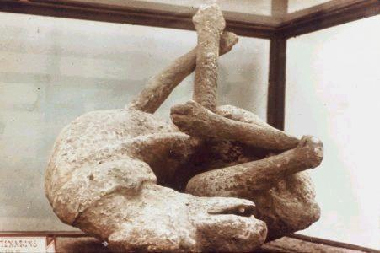 The Pompeii Dog is a fine example of the continued devotion between a dog and its master. 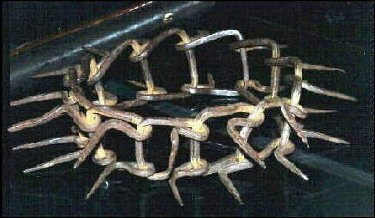 The dog’s collar was examined with infra-red, and it was found to be inscribed with a message documenting the dog heroically saving his owner from a wolf attack. Doggy devotion in ancient Rome was so intense, that Caesar reportedly had to publicly reprimand citizens for paying more attention to their dogs than to their children. 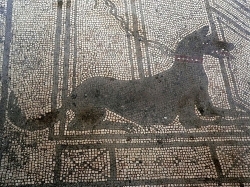 Shown here is an ancient Roman mosaic showing a nicely collared and leashed dog. These mosaics were very common in public places, showing up in halls, on sidewalks, and in city squares. 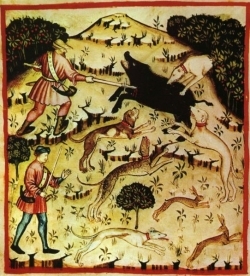 In the Middle Ages, dogs were used mainly as hunters and shepherds. Their collars became more utilitarian to match their new duties. Simple leather was used for boar hunting and hare hunting dogs, as an identifier and probably as a means to attach a leash when the dog was not hunting. During the hunt however, the hunters would use a stick rather than a leash to control the dog. This is perhaps because the humans did not wish the excited dogs to get too near to them. The shepherd dogs wore spiked collars to protect their necks from lurking wolves. 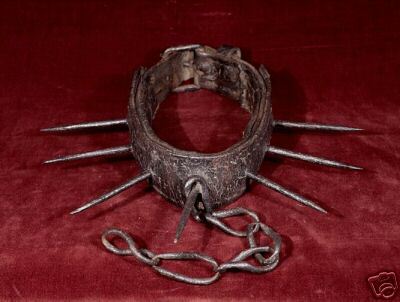 This was a good use for the spiked collar, and invention made possible by the advances in metalworking. However, spiked collars were also being used in wolf hunting, where the dog would be sent toward the wolf as bait and canine casualties were expected. Some of these collars may have been sufficient protection, but it is lamentable that many dogs lost their lives to this unnecessary sport rather than in the line of duty protecting a flock. Fleshing the hounds. After a successful hunt, the trusty dogs are rewarded with fresh meat. Look! One lucky pooch gets to chew on the head! The growing middle class could now afford dogs, and pets were no longer a royal or noble luxury. To collar the dogs, more affordable materials were needed. Leather collars without much decoration were the norm, and rings for leads and name tags began to dangle from street dogs around Europe. By this time the widespread dog ownership called for ordinances, and a system of of dog registration and licensing was born. Decrees were sometimes issued stating such laws as an obnoxious dog found without a license could be killed on the spot, or declaring that large dogs should have toes removed, in order to slow them down and protect the royal’s game. The availability of money and materials led to innovation in collaring for upper class dogs, but not always to the dogs advantage. The only advantage provided by such collars as the ones pictured here was preventing the dog’s throat from being crushed. The fact that the dog had to wear the collar in the first place indicated the kind of activities in which he was involved. Fighting dogs and hunting dogs used as bait were common. Henry VIII used dogs as ill-fated but effective warriors. Only one Mastiff survived Henry’s most famous dogs vs. men battle, and he was given a silver collar (whup-dee-doo). Another type of collar made popular in this era was the padlock collar, a hinged piece of metal, sometimes with rolled edges for the dog’s comfort, with a padlock dangling in front. Only the owner possessed the key, and by unlocking the collar he could prove his ownership. In the Renaissance age of excess, where possessions and objects ruled, many dogs were treated as just that. It would be several centuries before the modern dog lover would make his debut. 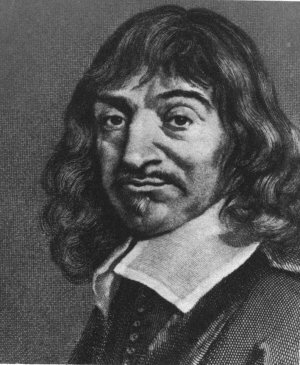 Rene Descartes, Enemy of Animals: Sic’em boy! After centuries of servitude, the dog was still considered a lowly beast, a piece of property. Even though many noble men and women had lap dogs as well as working dogs, sentiments about animals were not what they are today. Cruel practices like baiting with dogs, dog fights, sending messages inside dogs stomachs (which would be cut open to obtain the documents), and vivisection were still acceptable. The 16th Century philosopher Descartes prolonged this attitude, when he argued that animals are like machines, that any cries they make in response to pain, for instance, are like the groan of a machine that’s stopped working. But thanks to continued scientific (and hopefully less painful) studies of animals and the counter-philosophies that came along in the 18th Century “Age of Enlightenment,” dogs would soon regain their ancient place as noble companions. A full-grown horse or dog is beyond comparison a more rational, as well as more conversable animal, than an infant of a day or a week or even a month old. But suppose they were otherwise, what would it avail? The question is not, Can they reason? nor Can they talk? but Can they suffer? Why should the law refuse its protection to any sensitive being? The time will come when humanity will extend its mantle over everything which breathes. This sentiment was the start of many laws regarding treatment of animals by both strangers and owners, and centuries of humans becoming quite attached to their dogs. Big sloppy doggy kisses for Jeremy Bentham. It was during this period that decorative collars, rather than sadistic ones, again became the norm for the privileged dog. With new technologies, beautiful silver, gold, and brass collars could be fashioned and stamped or engraved, or leather collars adorned with sparkling bells. Collars typically bore the name of the owner, rather than the dog. This was the easiest way to have your dog returned to you! In this age of printed materials, if a dog went missing owners could now offer rewards. 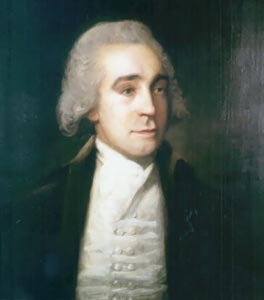 In the 18th Century rewards ranging from 20 shillings to 20 dollars have been documented. Pleas for the safe return of beloved hounds were found everywhere from newspapers to printed posters, once affixed to buildings like the modern brightly colored xeroxes we see stapled to telephone poles. In place of the owner’s name it became fashionable to have a witty saying carved into your dog’s collar, and many bore versions of the famous Alexander Pope rhyme, “I am His Majesty’s dog at Kew; Pray tell me Sir, whose dog are you?” Also, exquisite collars were fashioned and custom engraved for the winners of shows and competitions. Again, the owner’s name would be emblazoned on the collar, with perhaps a casual mention of the dog’s name at the end of the verbose dedication. Another testament to our love of dogs in this era was the new trend of writing elegies and epitaphs for our deceased critters, not to mention the great increase in dog portraiture. 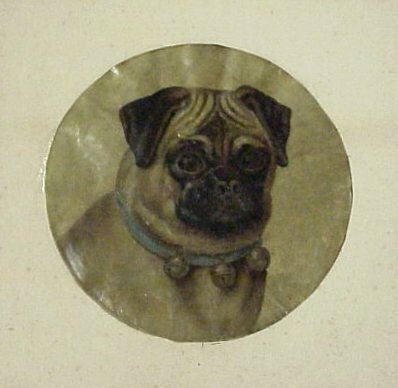 A Pug showing off a Belled Collar – All the rage in 1800! Today dog collars run the gamut from pup pampering to pup purgatory. Designer collars are a huge market for the overly-dedicated pooch-lover, and flashy colors, expensive baubles, and personalization are as popular as they would have been in the day of the pad-locked collar. Our consumer culture has provided us with name-brand collars (by brands normally associated with human-only apparel), Swarovski crystal collars, silver initial charms for collars, and more. Some of today’s dog owners still want their dogs to be useful and obedient. Technology has given us the citronella punishment collar and the invisible fence collar. Dog lovers are divided on whether these methods — the first of which delivers a spray of citrus to the dogs nose, and the second delivers an electric shock to his throat — are truly effective or are just plain cruel. Dogs today are also joining the modern “green” movement with a return to natural materials. 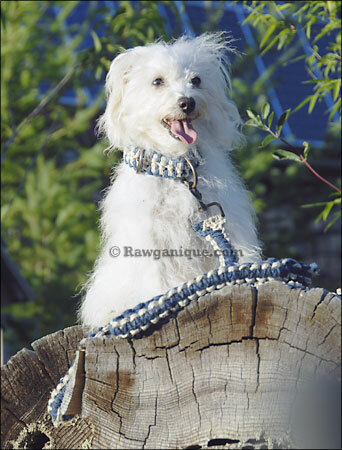 Hippy dogs and cats alike can be seen camping and playing hackey sack in their organic hemp collars.